Reconstructing a phylogenetic tree involves searching for the clues that tell you about the relationships among different species and then applying rigorous, and often quite complicated, analytical techniques to turn your pile of clues into your best hypothesis about the actual tree. 1. Identify and analyze characters shared by the species for which you're constructing the tree. 2. Use outgroup analysis to determine whether each character state is either ancestral or derived. 3. Group the species based on your analysis. ^ Identifying the characters: Character simply refers to an organism's specific, measurable traits. A character can be just about anything — hair, eye color, ability to digest milk, and resistance to antibiotics, for example. ^ Determining the different states the characters have: The character states could be hair present and hair absent. ^ Polarizing the characters: Polarizing characters refers to determining the direction of evolution with respect to each particular change. When you take all your clues and put them together into a tree, it helps to know which of the character states is the ancestral state (the one before the evolutionary event) and which is the derived state (the one after the evolutionary event). ^ Both the platypus and the rabbit have hair. ^ Both the platypus and the turtle lay eggs. You know that both characters (hair and egg-laying) have two states: present and absent, as in "has hair/doesn't have hair" and "lays eggs/doesn't lay eggs." ¿jtiM^ When scientists decide to reconstruct a phylogenetic tree, they have to decide what characters, or traits, to use. These characters can be either morphological (visible physical characters) or molecular (genetic). In this section, I limit the discussion to morphological characters, such as wings, flippers, and eggs. Before scientists knew about DNA and DNA sequencing, they were limited to these types of characters as well. Today, the ever-increasing amount of information available about DNA sequences gives scientists the opportunity to use the organism's nucleotide sequence (basically, its genes; refer to Chapter 3) as a character. Now you need to determine which character state is ancestral and which is derived. To do that, you use outgroup analysis. Collectively, the species you're trying to make a tree for — in this example, the platypus, turtle, and rabbit — are called the in group. The outgroup includes species that don't belong in the in group. In this example, they'd be things like clams, bumblebees, and mushrooms — things without backbones and four legs and stuff like that. ^ Almost all the animals in the outgroup lay eggs. From this character, you can conclude that live birth is the derived character state and that laying eggs is ancestral. ^ None of the organisms in the outgroup has hair. From this character, you can conclude that hair is a derived state. After you've polarized the characters, you're able to conclude that the split between the platypus and the rabbit occurred after the split between the lineage that led to the turtle and the lineage that led to the ancestor of the platypus and the rabbit. Based on analyzing the outgroups, you know that "laying eggs" is the ancestral state and "live birth" is the derived state. You also know that "no hair" is the ancestral state and "hair" is the derived state. 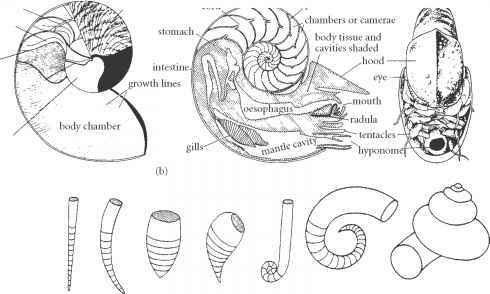 From this analysis, you know that in the past, farther down the tree of life, critters laid eggs but didn't have hair. Under this scenario, the change from egg-laying to live birth doesn't help you group any two species as having the most recent common ancestor. Only one of the species — the rabbit — has this derived character state. Because only one species has the derived state, you can't use it to form a group. The situation is different for hair. Two species — the platypus and the rabbit — have the derived character state, which allows you to group these two species as having a more recent common ancestor than the common ancestor of all three species. You envision that the platypus and the bunny have a hairy ancestor, so they both have hair. To reconstruct evolutionary history successfully, you need shared derived characters — evolutionary events that enable you to differentiate among different groups of organisms. In Figure 9-6, shown earlier in this chapter, the monophyletic-group mammals can be distinguished based on the presence of several novel traits, such as hair and the production of milk. The dolphin and the chimpanzee can be further classified as a monophyletic group based on the derived character of live birth. The platypus retains the ancestral condition of laying eggs. When comparing character states among different species, you have to make certain that you're comparing two different states of the same character rather than two completely different characters. Take the case of forelimbs. Humans have forelimbs; earthworms and bacteria don't. A scan through the diversity of life suggests that having forelimbs is a derived character state. Because the forelimbs in vertebrates share a common evolutionary origin, they are said to be homologous. Homology, which is similarity as a result of common descent, helps scientists reconstruct the history of evolution and determine the best estimate of the tree of life. Although forelimbs themselves are homologous, they can evolve in several directions: into wings in birds and bats, flippers in dolphins, arms in humans, front legs in horses, and so on. I Convergence: Different structures in two different organisms evolve to appear similar. The streamlined shape and fins of dolphins appear similar to those of sharks and fish, but closer analysis reveals that the structures are quite different — an example of convergence. Dolphins and sharks don't share fins because their common ancestor had fins; they share fins because fins evolved independently in the dolphin lineage. i Reversal: A structure that previously evolved is subsequently lost. The moa is an example of a reversal. Moas, like most of the other vertebrates, don't fly; they're similar to chimpanzees in this regard. But the similarity is not the result of descent from a common ancestor that didn't fly (though it's true that the most recent common ancestor of the moa and chimp didn't have wings). Numerous structural characteristics of the moa skeleton place the moa firmly within the group of birds, and its ancestors had wings, but these wings were lost during the course of evolution to larger body size. i Parallelism: Two organisms evolve to acquire the same trait, but — and this point is key — they don't share this trait because of a common ancestor. Rather, they share the trait because it evolved independently in both lineages. As the preceding section explains, the presence of fore-limbs in birds and bats is the result of homology; both species descended from an ancestor that had front limbs. The fact that the front limbs of bats and birds now function as wings is a homoplasy because wings evolved independently in the two different lineages. Most mammals don't fly; the evolution of flight in bats happened independently of the evolution of flight in birds. The presence of homoplasy throws a wrench into the works, limiting your ability to reconstruct the tree accurately, because it's not always simple to tell when a character similarity is due to homology or homoplasy. So how do you know that the phylogenetic trees you can create represent evolutionary relationships accurately? The answer is the way you know anything: Someone did an experiment and checked. eSiv^*^. David Hillis and co-researchers set out to determine how well different meth-tjf ods of phylogenetic reconstruction worked at reconstructing the history of evolution. To do this, they needed to know the history of evolution, and they came up with a very clever method. Taking advantage of the fact that viruses have extremely short generation times, they produced the tree of viral lineages in the laboratory. They started with one virus, from which they collected different mutants. Then they grew these slightly different viruses, collecting mutants from these viruses in turn. In this way they were able to generate a branching tree for which they knew the exact pattern of the branches, because they knew which viruses came out of which flasks. The different strains of viruses didn't become different species over the course of the experiment (and as Chapter 8 explains, scientists aren't completely clear on what constitutes a species in viruses). But the descendant viruses were different enough from the parent virus to allow Hillis and his co-workers to construct an evolutionary tree. Viruses don't have a lot of characters like eggs and hair, so the researchers determined what changes had occurred in the viral DNA. They were able to demonstrate that it's possible to measure the traits of the terminal taxa and accurately reconstruct their evolutionary history. In addition, they were able to use the character states of the terminal taxa to make good predictions about the character states of the ancestral taxa at the nodes of the tree. Because they had kept all these ancestral taxa in little vials in a freezer, they were able to show that their predictions were accurate.